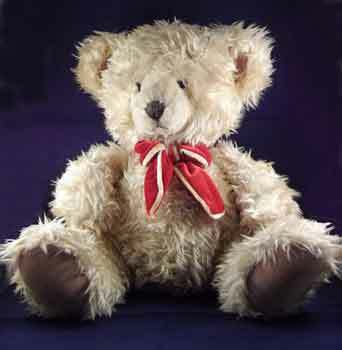 Russ Berrie Teddy Bears - Welcome to my sales page. I love Russ Bears, especially the more traditional bears. They are always very soft and extremely good to cuddle. They are made to a high quality and always have great expressions on their faces, which makes them very irresistible. 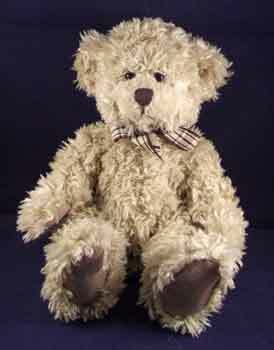 As the Russ Company are no longer around, Russ bears are now becoming more collectible. 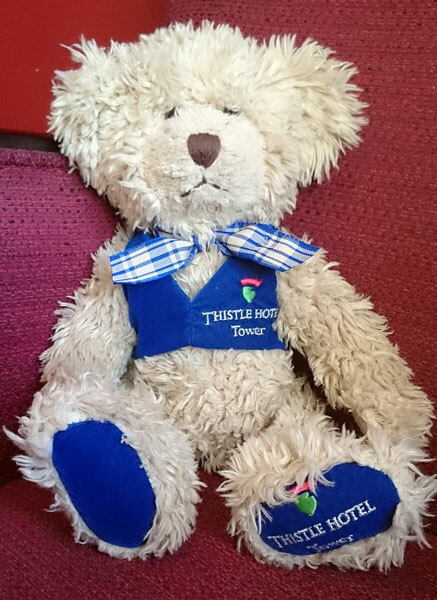 Horace is an unusual Russ Berrie Bear as he was especially made for the London Thistle Hotel at the Tower of London. So he was only available to buy from their shop within the hotel. As you can see he is wearing a little blue velvet waistcoat which is embroidered with silver lettering and a coloured logo. He also has blue velvet paw pads on his feet also embroidered in silver lettering. Horace is 30cm from top to toe and has soft slightly curly fur. Description: Radcliff is a lovely Champagne beige colour and his fur is curly. He is usually only dressed in a brown and white spotted bow. 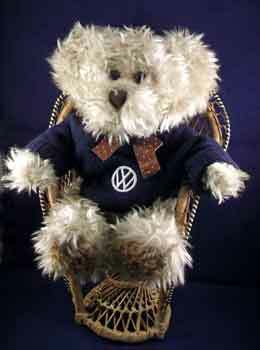 However this bear also sports a lovely blue jumper with a Volkswagen embroidered symbol. Radcliff is very soft and floppy and is a little heavier than other bears as he is filled with both soft filling and pellets. Description: Tennyson is one of Russ Toys most popular designs. This is the baby version of the bear and has a lovely curly light brown fur with a plaid bow. He is lovely and soft and great for cuddling. Description: A very plush looking bear with a bright golden curly fur. He has a velvet red and gold bow around his neck. 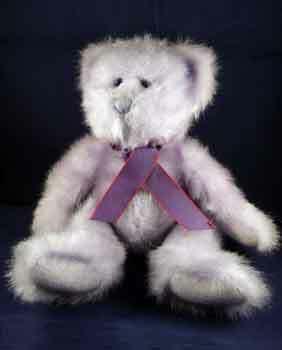 Description: This bear has the most gorgeous lilac colour plush which really makes this bear stand out. She has a purple and red bow around her neck. Postage is worked out individually when you pay. I always try to charge the minmum.